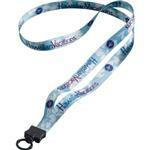 Our soft 1/2" wide cotton lanyard is our number one selling promotional lanyard! Versatile and comfortable, great for tradeshows or employee security wear. 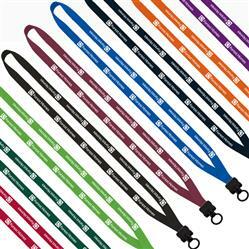 Standard "o" ring attachment allows you to attach your own tags, or for small additional cost add one of our bulldog clips or other custom lanyard attachments. Lots of colors to choose from. For other conference giveaways please call us at 888-332-ADCO! 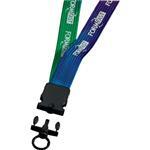 FOR LANYARD ATTACHMENT OPTIONS, CLICK HERE - SEE TYPE C LANYARD ATTACHMENTS! Production Times Available: 5-7 working days standard. Rush available, please inquire! Typical Imprint Area(s): 3/8" x 12" - front side; left + right panel . Cotton. Add your choice of bulldog clips, water bottle holders, name badges and more - please inquire and we will email the options to you.